Scott is known for his deep, layered stories such as what he’s done so far with Batman in the New 52. With Superman Unchained, he’s been slowly doing the same for Superman as well, and I think that this is the issue where it all really starts to come together because finally we get the big reason why Wraith is such an important character for Superman to be played off against. And not only that, but Scott also roots the story in the New 52 with a bunch of cameos and really expands on the entire mythology of this comic world surrounding Superman, as well as providing a long list of consequences of Wraith’s arrival on Earth in the late 1930s. There are three distinct narrative divisions to the story. The first of these deals with all the interactions between Superman and Wraith. In the previous issue they saved Tokyo from the techno-terrorist group Ascension and now they are after more bad guys, together. But in a really neat twist, Superman takes his alien kinda-doppelganger to his Fortress of Solitude and shows off his secret hideout while at the same time keeping abreast of the latest threats. The entire conversation between them really touches on what place Superman has in a world where everyone around him will age eventually but he will not. And Wraith questions how Clark Kent would fit into all of this when 10, 20, 30, more years from now his friends are dead or dying and he is still alive. Its all quite touching, and given the lack of action in the issue, the character drama is almost flawless where these two characters are concerned. The second division deals with Lois learning the origins and purpose of Ascension. The pacing is somewhat off with this particular part of the script and it kind of meanders along because it is heavy with exposition, but all the same, there are a ton of twists here that are up for grabs and Scott really makes the experience worthwhile in the end. His portrayal of Lois has been one of the strengths of this series and this issue continues to cement that particular element. I really wish that Lois had a more central role in the series. Hell, I wish she was much more prominent over in Superman too, but in the absence of that, I’ll take what Scott has to offer because so far he has treated her like a real, three-dimensional character and he’s given her the respect that a long-term character like her deserves. On the art side we have a switch of sorts. The third division in the story is a flashback sequence that, on the surface of it, has almost nothing to do with the other two divisions. But, it is important in a more subtle and layered way because it acts as a warning for what’s in store for the reader by the end of the issue. And we have not the regulars Jim Lee, colourist Alex Sinclair and inker Scott Williams on these sequences, but Dustin Nguyen. Dustin has a very distinct art style that is separate from that of the regulars. and I have to say that I loved his sepia over tones and the lush watercolours. Some amazing contrast there with the great artwork from the series regulars. There are times when Dustin’s art isn’t detailed, not as much as it could be, and it hurts a few of the panels but by and large, things are looking pretty good. And Jim, well, not enough good things to be said about his work is all I can say. And the same goes for Alex and Scott W. too. A great installment, and I definitely look forward to the sixth issue this month. If there’s any major downside to this issue, its that Lex Luthor and Jimmy Olsen are completely absent and that particular subplot is left completely open and hanging. 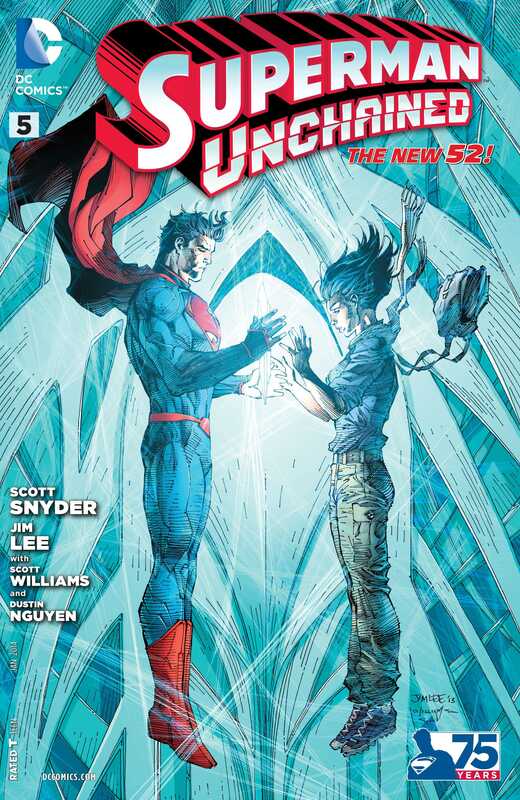 More Superman Unchained: #1, #2-3, #4. Posted on January 4, 2014, in Comics Reviews, Review Central and tagged Alex Sinclair, Aliens, Clark Kent, Comics, Comics Review, DC Comics, Dustin Nguyen, General Lane, Jim Lee, Lois Lane, New 52, Review, Review Central, Science Fiction, Scott Snyder, Scott Williams, Superheroes, Superman, Superman Unchained, Wraith. Bookmark the permalink. 2 Comments.